Did not like this beer that much. I could still drink it, but not good. The appearance was a sunshine yellow with a big mean frothy white head. The head had great tiny bubbles and left a thick lacing, thus the score. The smell was of Belgian yeasts, lemon peel, earth, a bit of light flowery incense. The taste was a mess, belgian yeast with citrus flavors, straw or grass and coriander. The mouthfeel was super super carbonated which raped the tongue with these mediocre flavors. Not a fan. The mouthfeel, as mentioned above, was overly carbonated where you could tastes some things very strong, and others just a hint. Had a hard time drinking this whole bottle. Not recommended. Snifter at Belmont Station. Portland, OR. Bottle split with friends. Poured from a 750ml bottle into my New Belgium snifter. Looks nice. Straw colored, creamy white head. Smell is alluring. Spices, sweet oats, and a light wheat malt. Taste is good, not great. Sweet malt, orange-wheat, and lavendar dominate. The lavendar is a nice take on this but kinda makes me feel like I'm drinking my girl's bodywash or something. It's not to dominant, but lingers ever so. Nice carb and proper visco. Drinkability is good, could go better with a warm day rather than Cleveland in December. Be careful when you pour or have a sponge on hand, even a moderate pour fills half the glass with bleached bone white foam, thankfully it's active enough to both look like a bucket of worms and dissipate quickly, still the lacing slippery when wet. Extremely light yellow color, no concentration at all and might even pass for an adjunct lager. The nose bursts with clove and coriander spice, potpourri musk and lemon to orange pulp, some soft oat and sweet yeast accents, even with ripe peach, apricot fruit scents lifts into an above average perfume. Light to medium-bodied, prefers to dance ballet than a dirty grind. The carbonation appears overly foamy at first but with more sips calms down and fits the whole. Sweet lemon and orange citrus teams up with yeast and honey glazed bread to make for a friendly impression without overdoing it, retains fresh cleanliness. Pear, apricot, yellow apple fruit substantial but, too, don't turn things too sweet. Vanilla bean clove, ginger remain in proportion. Oat and graham cracker aspects, the hops here are fully tamed and knit in. The floral side only apparent at the end. Nonchalantly complex, a real easy drinker which rewards focus and attention. Pours hazy piss yellow color with a 1 finger creamy white head that fades slowly, leaving very good lacing. Smells of spices up front, followed by yeast, lemon, clove, coriander, orange peel, pepper and exotic spices like potpourri and bags of Indian spices which I can’t distinguish; very floral and spicy nose that is hard to pin down and very interesting to say the least. Tastes very spicy as well, with yeast, lemon, clove, coriander, orange peel, pepper, sweet malt, floral hops, cinnamon, bubblegum, brown sugar, cumin, sour apple, citrus hops, flowers, grass, hay, spices like potpourri, allspice, ginger and some fruit or spice that I can’t make out. Very complex and complicated flavor, in fact it could be the spiciest beer that I've ever had. This beer borders on sensory overload, and was a tad bit too over the top for me. Mouthfeel is creamy and smooth, as this is light, crisp and airy, with a high level of light bubbly carbonation; this has a crisp, clean finish with a nice ginger snap at the end (pun intended). This was different and interesting, but I'm glad I had it on tap and didn't need to finish a whole bomber by myself as it would have been a struggle. My least favorite Bruery product to date and not one I'd seek out again. It felt good, and smelled exciting, but the taste just didn't do it for me. It's a good representation of the style, but just too spicy for me. Appearance: First impression.. HOLY BUBBLES! Tons of bubbles in this thing. Looks like a reverse waterfall. Golden yellow color. Huge head. 3+ fingers. It recedes rather slowly (and that's too quick of a term to use) and leaves minimal lacing. Very creamy head. Smell: Floral aroma is predominant. Very very soft flowers. Almost like a spring garden. Bready smell is in the background of the beer. Also a little bit of citrus. Nothing too out of the ordinary. Taste: Pretty standard for a witbier. There's a taste in it that I can't exactly put my finger on. It must be the lavender taste that they advertise on the bottle. But like I said, it's a pretty standard witbier taste. You have the corianderand yeast of course... The lavender taste really does dominate it though. It's not well balanced, although I do like the flavor it gives off. Mouthfeel: Very well carbonated. Almost too the point where there is too much carbonation... but not to the point it's a turn off. Maybe just slightly overdone. Medium to Light body. Probably leans towards the light side... has that watery style almost. I would like it a little more if it were a bit creamier and more full. Drinkability: It's not a bad beer at all. I paid about $10 for a 750ML bottle of this though, but I'm not so sure if it's worth that. There are many other Witbiers I can get a six pack of for $6-$8 and be much more happy. With that being said, it is a pretty drinkable beer, as most witbiers are. It's just rather expensive for the amount you get. Presentation: 750 mL bottle poured into a Sam Adams Perfect Pint glass in three parts. Appearance: Pale orange to straw yellow in color. Initially, there is a large three finger white head that recedes rather slowly into no head at all. Some sediment floats around the glass and lots of carbonation is noticable through the glass. Aroma: Spicy lavender and floral aromas are most apparent. Some bready wheat notes and crisp citrus also make there way through but are subdued compared to the lavender. Taste: The lavnender really takes center stage here. It's too much here though. The cirtus and wheat are here but are overpowered. A bit watery toward the end. Clean aftertaste. Lavender is just too much here though, this lacks balance. Mouthfeel: The oats are really noticable here as the mouthfeel is really full and chewy, especially for a witbier. Not much carbonation. Relatively smooth. Drinkability: Low ABV and light flavors, with the notable exception of the lavnder, make this beer really drinkable. The lavender does wear thin after a while, but I had no trouble killing a whole bottle. Overall, an interesting take on the witbier with lavender taking center stage. If it were more finely tuned, then this beer could showcase the lavender without making it overwhelming. Definitely an interesting take, but it need more balance in my book. Finally got around to picking this one up... Had it on a 90 degree day after working on my roof cleaning gutters and putting in a gutter guard. Reviewed from dictated notes. Huge luminous fluffy white head towers a full four fingers over a pale straw-colored hazy body with TONS of carbonation. Streaming vibrant columns of bubbles through the middle of the glass look pretty darn good. Smells of green apples and spicy wheat. Little white pepper note. The sweetness is surpassed by the almost tart/citrus note that strongarms its way to the finish--- ends up very refreshing. This might be served a little cold, but I was hot. That lemony citrus note is fantastic when it mingles with the wheat and bready malt. 750 ml bottle poured into a Unibroue tulip. Huge, fluffy white head, mild lacing. Aroma is pretty interesting with some nice citrus, coriander, maybe a touch of funk. Taste follows suit, no shortage of flavor. Nice, authentic tastes with a nice "California" twist. Really delicious interpretation. Unfiltered, bottle-conditioned, brewed with spices (coriander, citrus peel, lavender), wheat and oats. Pours quite lively with tons of carbonation and a good three-finger, foamy white head. A pale golden brew beneath that's touched with haze. Yeasty in the nose. Metallic too, with soft floral notes, suggestions of nectar, hay and a soft lavender. Medium-bodied, even consistency, super creamy. Nice round malt sweetness, with definite oat and wheat notes, which are a bit rough around the edges but nicely balanced with a touch of residual dextrins, suggestions of honey, orange peel, slight citrus smack and musty herbs. Tea-like in many ways. The addition of lavender really works well with the style, too. A bit powdery here and there. Finishes yeasty, with a deep bread flavor that runs into the lingering and overall dryness. Unique. Layered with complexities. Amazingly quaffable. Top-notch for the style. Wow what a unique Wit. Pours a clody pale yellow with a big white puffy head. Then you get the aroma. Big hints of Lavender, and yeasty bread. Never had a beer with such a sweet flower bouquet. The taste is also unique. More flower taste. Has the flavor of edible flowers you sometimes get in salads, as well as a bready biscuit flavor.This beer is as close to a champagne or wine as I have had with a beer. This is the one to pair with foods and to have the non-beer friends try. Bottle cap comes off with a huge release of air. Pfffft. SOunds like it could be a little charged up. A gentle pour generates a very big and airy white snowcap of froth. It becomes rocky as it dissipates. Pale white body shows vigorous carbonation throughout. Vibrant nose of orange peel, coriander, lemon zest and sweet malt. As expected, this beer is airy and gaseous. It's drinkable, but the body and carbonation are really lacking. Flavor is decent enough, but really brought down by the gaseous feel. Flavor is lemony and spicy. Really a letdown for such a "high end" beer. A friend brought me this bottle for Virgina. We drandk it while watching a little football. A- Pours a hazy/yellow color with nice one to two finger head. S- Very yeasty/ wheat smell. T- I think the brewer of this Belgian style ale tried to be too traditional and made this ale bland. As it warmed the flavors just were not there. M-medium carbonation with somewhat smooth finish. D- Light body makes it able to drink well. Pours perflecty hazed & luminous yellow color with creamy white head (almost too much head). Plent of yeast to make this thing appetizing in appearance. Nose is ripe with citrus and esters, especially lemon/orange. Palate offers a pleasing sourness with the citrus fruit, yeasty flavors, and soft malt component. Light bodied and easy drinking. Would go well with breakfast. Appearance: The pour is slightly cloudy with a sunshine wheat color. A whopping three fingers of head shows up on top, but it's not unexpected. I was ready for an aggressive beer. While holding up my snifter to the light, you can see how effervescent it is. This isn't Orval level of carbonation, but a highly carbonated beer nonetheless. There's no lacing on the side of my snifter. Smell: The nose picks up the normal wheat beer notes. A mixture of wheat and a little bit of clove spice. There's also some fruitiness to the beer, but it's slightly acidic. Perhaps it's lemon. The bottle says I should be picking up lavender notes. I'm not sure that's what I've got, but it really does have a nice herbal floral aroma. Taste: The palate lines right up with the nose. First up is some wheat flavor. The bottle says it was brewed with oats, I'm not sure I can pick those up. Next up comes some spice from the yeast including clove and some coriander. On the finish is a nice citrus mix of lemon and orange. Mouthfeel: As already said, it's a well carbonated beer. It's sitting right at a medium body, not too chewy, and not too thin. I still think the beer was much more enjoyable as the carbonation died down a bit. I was able to pick up more flavors as it warmed and lost it's carbonation. It would have been nice if it was ready to go from the beginning. Drinkability: The ABV and body make this a very easy beer to drink. The flavor and aromas are pleasant, but not good enough to end up in my crate again. The Orchard White pours a just slightly hazy golden body with a brass cast. The head rises up quickly, but then settles readily into a short lid of foamy white. Very good retention. Good lacing. The aroma is initially almost perfume-like, and quite floral. Yeast then steps in, along with peppery-spice, wheat, citrus (lemon zest, but also grapefruit) and chalk, apple, subtle pear, some grassiness, and a quick dollop of sugar. A slight bit of sulphur is present as well, but it's not unpleasant. In the mouth it's light-to-medium in body and gently bristling on the tongue. The flavor follows the aroma but it's not as bold. You need to really breathe it in as you taste it to get the full effect. Additional notes to those found in the aroma include cut green pepper and clove, cardamom, and perhaps a hint of almond and vanilla in the sugary note. It's not particularly bitter, yet it's balanced, and it finishes refreshingly crisp and dry with rotating notes of citrus, pepper, and spice. In addition to its readily accessible nature, the Orchard White is actually quite complex, and that lends greatly to its drinkability. There are plenty of subtle nuances to be found, and it's not so big that you can't have more than one or two. Quite nice!!! Pours a golden straw color with a light white powdery wheat head. 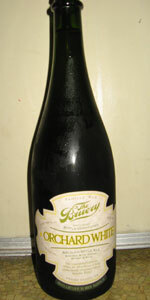 Taste of first and foremost doughy belgian house yeast from The Bruery, pepper, citrus and other belgian spicey flavors. Bottle courtesy of yamar 18. Thanks Kevin! Pulled straight from the fridge, it pours a hazy yellow gold with a 2 finger head of foam. The smell is yeasty and lemon fruity with a healthy floral note and some spicines. The taste is of coriander, lemons and oranges of the zest variety, light notes of bread near the finish which itself is lightly spicy, lightly fruity. Nice. I'm digging this one. The mouthfeel is close to medium with a brisk amount of carbonation. Cut the carbo just a tad and this would be a very smooth brew. Drinkability? Much tastier and much easier to drink than the Black Orchard, ok, different style altogether but still, The Bruery did a fine job with this one. And this is very refreshing as well and the head retention and lacing are, again, very good. A very nice drop, a very nice Witbier! Pours a fizzy, cloudy, yellow with a ton of head. Tons and tons of yeastie floaties swimming around in the beer. The smell is very odd. It reminds me of lavender, like an aroma candle or something. This beer taste like flowers. Not like flowery hops, it tastes like I went to a florist and took a bite out of a huge pot of flowers. It's a fairly clean taste but there's a yeasty off taste near the end that's hard to deal with. I might not be getting the point, but this beer tastes a little bit too much like detergent for me to enjoy. Super pale white ale pours from my 750ml bottle with a bright white egg shell white head forms fine speckled lacing as it slowly dwindles. Aroma has strong layers of citrus peel, sharp wheat presence, and an interesting layer of lingering lavender. Flavor is sharp with wheat a nice citric laced breadiness and heavy lavender additions throughout each sip. Perfume herbal notes for sure seem phenolic/plast/medicinal all in one on the palate. I can get past it after a few sips, it adds some uniqueness to an overchurned style but these Bruery beers seem pretty special thus far. Mouthfeel is uber carbonated with a cloying herbal spice mix clouding the palate, medium bodied moderate alcohol with the lavender sticking around. Overall this beer would be better as a straight up white, versus an lavender infused witbier...I have liked most of the Bruery's offerings thus far. I'm not sold on this one, sadly.